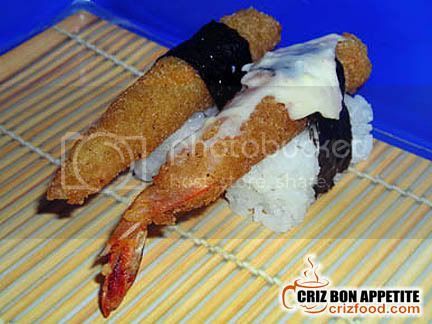 Suddenly I had an urge to go for sushi after having tasted the delicious sushi brought by CK Lam during the 3rd Penang Floggers Gathering. I immediately headed out to the Pulau Tikus Market where all the yummy hawker stalls are. Hidden from the sight of the main road (Jalan Pasar) was this dimly but beautifully decorated stall selling sushi. The two owners, Boon and Sandy, had manned this stall for many years. Although hidden from where all the crowds were, business remained quite smooth flowing with consistent flow of patrons. What attracted their customers was the 100 over selections available, taste, presentation as well as the price of each sushi. 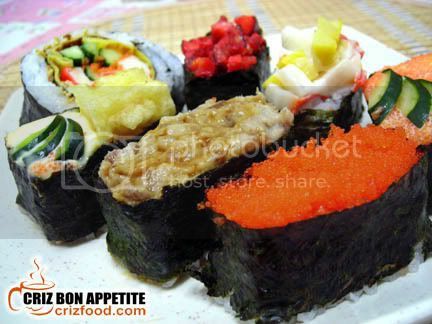 Prices can range from as low as RM1 per sushi to RM5 per sushi with large fish roes. 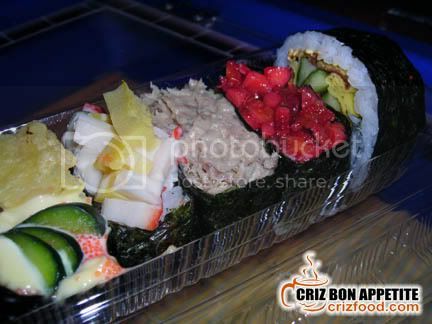 You would not believe that I had a 7-piece sushi takeaway such as the Califutomaki, chopped baby octopus, tuna, prawn, crabstick & egg, fish roes and prawn roes sushi as shown above for a mere RM7. Yup! You heard it right! Each sushi costs only RM1. There were more available but I chose what was available as the sky was beginning to drizzle at that time. 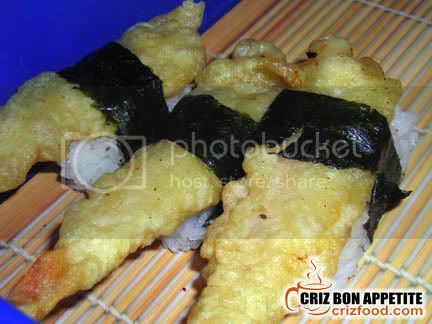 Here are some snapshots of their other sushi. You do not have to worry about the unavailability of your preferences as shown on the menus on the stall as well as on the special order menus as either Boon or Sandy would be more than happy to make them for you. In fact, you can always ask them for their house specialties. If you are coming from Jalan Burmah into Jalan Cantonment, turn left into the first junction. 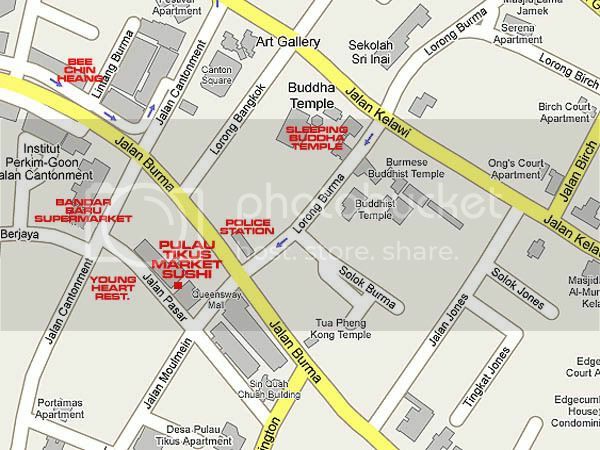 That’s where the Pulau Tikus market is and that’s also where the night hawker area is. Move further up until you see a small lane beside a bakery on your left. 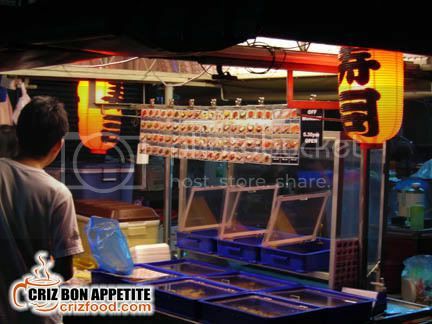 You will see the stall at the corner with two lighted up red Japanese lanterns. Address: Lorong Pasar, 10350 Penang, Malaysia. So THAT’s CK Lam’s secret!! The variety is incredible, given the limitations of operating outside a kopitiam. Simply amazing! large fish roes and the baby octopus sure give an appetite for the meal. It has been a while I haven’t tasted sushi already. Really want to make a trip for the sushi with the 3 musketeers. I bet AO sure will not reject this proposal. 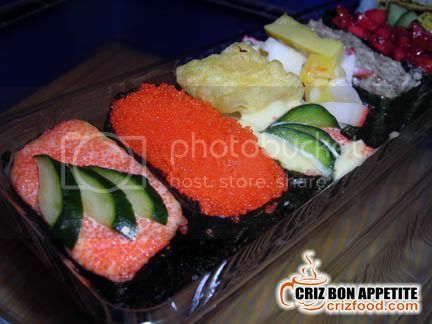 Btw, other than this PT sushi corner, I used to buy sushi from Queensbay Jusco. I love the salmon there for the affordable pricing and also the freshness. 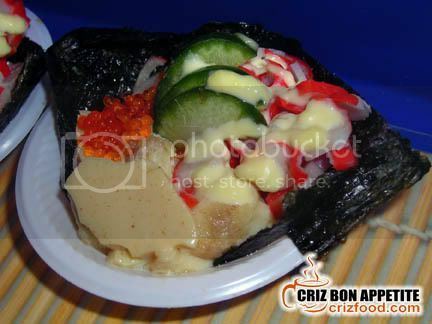 wow, hawker rate but quality food, great recommendation Criz! I love sushi too! Hi, Just wondering if the stall still open? ?